Take your brisket and rub a hearty amount of salt, sweet paprika (smoked paprika would also be great) and ground cumin. I would guess I used about a tablespoon of each. Note: I only cut the brisket in half to fit in the dutch oven more easily because it was a long cut. 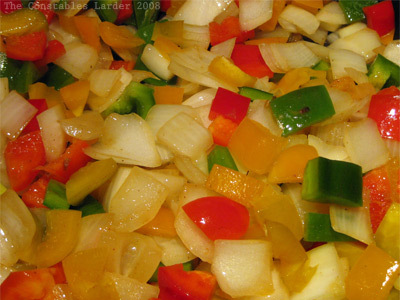 In a large oven-proof pot or dutch oven, saute the onion, garlic and sweet peppers in olive oil until the onion starts to turn slightly transparent. 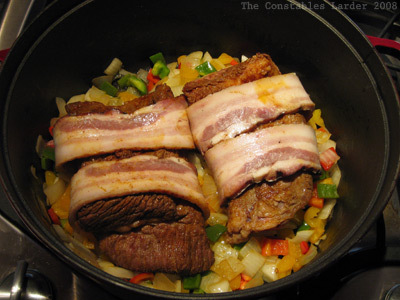 Keeping the pot on low heat, wrap the bacon around the brisket and place on top of the vegetable base. I had very thickly sliced slab bacon, and so with more normal bacon I would probably use a few more slices. De-seed your carnival squash (a butternut squash would also be great), remove the tough skin, and chop it into 1/2 inch dice. Then add the squash around the brisket. Halve your tomatoes across the middle (if it was the earth and the stem was the north pole, you would be cutting across the equator) and de-seed. Then place in a food processor with the two bay leaves and pulse until smooth. Pour this on top of and around the brisket, and then pour in the white wine. Cover and place in the oven for 4 or 5 hours. This is what the braise looked like after about 2 hours. 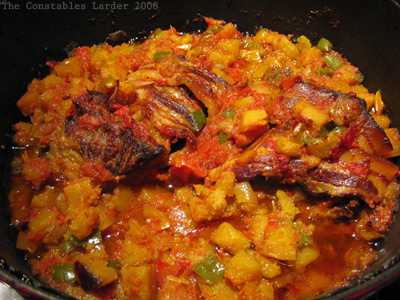 At this point, you can taste the vegetable mixture for salt and add more if needed. Spoon some of the braising liquid over the top of the brisket, then return to oven. After about 3 hours, I pulled it out and spooned off some of the excess fat on top of the liquid, and again spooned some of the remaining liquid ove the meat. When I placed the pot back in the oven, I left a very slight crack open on the lid to let some of the moisture out. In total, I cooked the braise at 275F for just over 4 hours. As the cooking time gets on, you want to keep an eye on the amount of liquid so it doesn’t dry out. 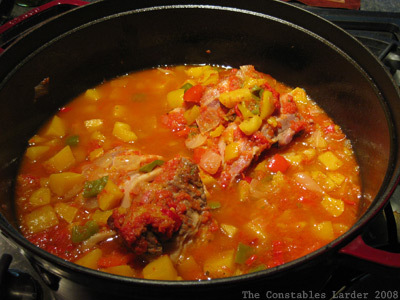 If the braise is moist but only a little loose liquid remains, remove from the oven and keep covered until you are ready to serve. You can always reheat gently on the stove top. Make a sauce / gravy by taking two large spoonfuls of the vegetables and placing in the food processor with the juice of one lime. Add some ground pepper and puree. Add a little bit of water if you want to thin the consistency. 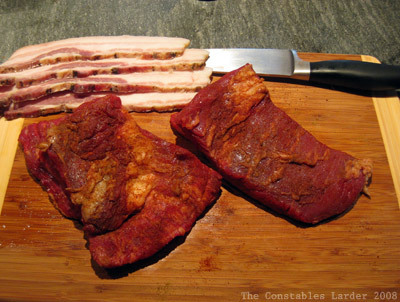 Take your brisket, discard the bacon, and with two forks, pull apart “slices” for serving, working with the grain. Taste for salt — you will most likely want to add some more salt to the brisket itself even though the vegetables are probably fine at this point. Braises tend to be difficult to plate beautifully for photos (although rustic bowls tend to work well). 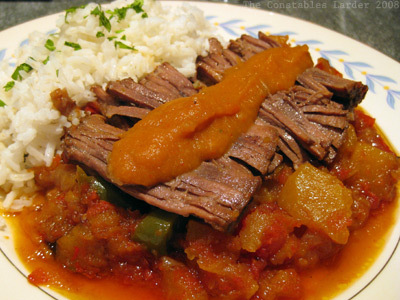 In our case, I served with some white rice (with a touch of cilantro sprinkled on top), and placed the meat on a bed of the braised vegetables, covered with the pureed sauce. So there you have it. Delicious! And now that I’m done writing, I’m curious: is that too many photos for this blog post? Let me know what you think. P.S. Lisl had the clever idea of using some of the leftover brisket and lime-veggie sauce the next day for quesadillas, along with chopped tomato and grated monterey jack cheese. SO good. Beautiful. Beautiful. Beautiful. This dish is fantastic! Thank you for sharing such a wonderful autumn recipe!